Maintenance script that reports the number of jobs currently waiting in master database. Definition at line 36 of file showJobs.php. 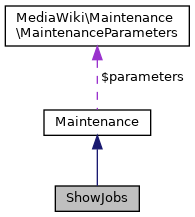 Definition at line 44 of file showJobs.php. Definition at line 54 of file showJobs.php. References $job, $queue, $type, as, Maintenance\getOption(), Maintenance\hasOption(), Maintenance\output(), and JobQueueGroup\singleton(). Definition at line 37 of file showJobs.php.